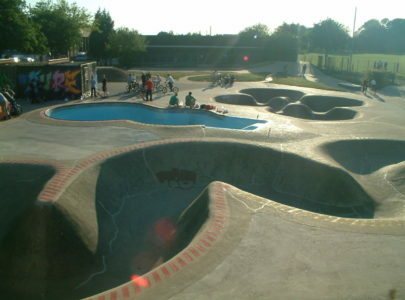 Are you the owner of London Harrow Skatepark? London Harrow Skatepark is a very cool skate park from the 70s. There your can find a snakerun without cooping therefore roll-ins everywhere. Very easy to drive as you get through the downhill automatically and you can skate everywhere out and drive in because of the roll-ins. Then there is a kidney bowl and and two more bowls with one has the shape of a peanut. In the center Flat, left and right banks. There is a halfpipe so without flat, like a half tube.